Corner of Hard Rock Rd. and W. Shady Grove Rd. Thanks to GPGS members who volunteered at Shady Grove Cemetery: Ben Grimes, Bonnie Cockrum, Carol Franklin, Howard McCalla, Rena Yarach, Tom Cogdell, Lynn Shumaker and Regina Shumaker. The first recording began in November 2010. 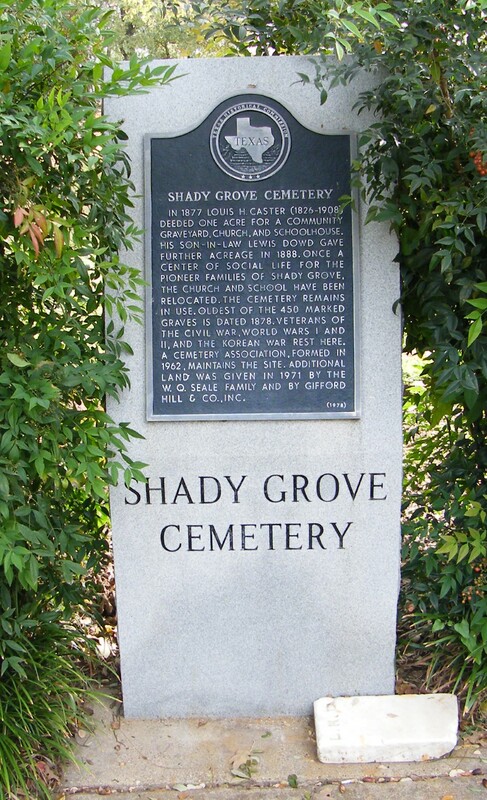 Shady Grove is divided into sections numbered from north to south; according to hand-drawn maps kept by the cemetery office. Each section is approximately 10 graves wide. Sections and Graves are numbered from north to south; with section one, row one, grave one being in the northwest corner of the cemetery. GPGS tried to interpret these maps along with our findings of grave markers to provide the most accurate information we could at the time of this recording. For simplicity, we have only made two sections; north and south, with the drive which enters from the west gate and turns left at east end to exit at the north gate being the dividing line. Rows are numbered from west to east. In 1877 Louis H. Caster (1826-1908) deeded one acre for a community graveyard, church, and schoolhouse. His son-in-law Lewis Dowd gave further acreage in 1888. Once a center of social life for the pioneer families of Shady Grove, the church and school have been relocated. The cemetery remains in use, oldest of the 450 marked graves is dated 1878. Veterans of the Civil War, World Wars I and II, and the Korean War rest here. A cemetery association, formed in 1962, maintains the site. Additional land was given in 1971 by the W. Q. Seale family and by Gifford Hill & Co., Inc.
January 13, 1877 L.H. Caster and his wife, Ruth Jane Lusk deeded to the Trustees of the Shady Grove School House, their heirs and assigns forever, the first acre for the purpose and use of a grave yard and a school house. The school was also to be used as a church. In August 1884 Caster’s son-in-law, Lewis Dowd deeded an additional .0162 acres of land to be used for a public free school. The school claimed no interest in the first tract of land. October 5, 1888, L.E. Dowd conveyed about two acres from the John Spoon Survey to “white citizens of the community surrounding the land by whatsoever name it may be known, for the purpose of a burial ground forever.” Community members and others came together on Memorial Day and cleaned up the cemetery. One of the carpenters drove the four miles in a wagon with a team of horses to Grand Prairie to purchase material for coffins. They built their coffins filled with cotton batts and lined them with white "domestic" (cotton cloth or household linen). was donated by Roy and Asa Seale and Irene Seale Raddatz. It was about this same time that the Shady Grove Cemetery Association came into being. The cemetery was given historical status in 1978 and a Texas Historical Commission marker was dedicated on May 19, 1979. 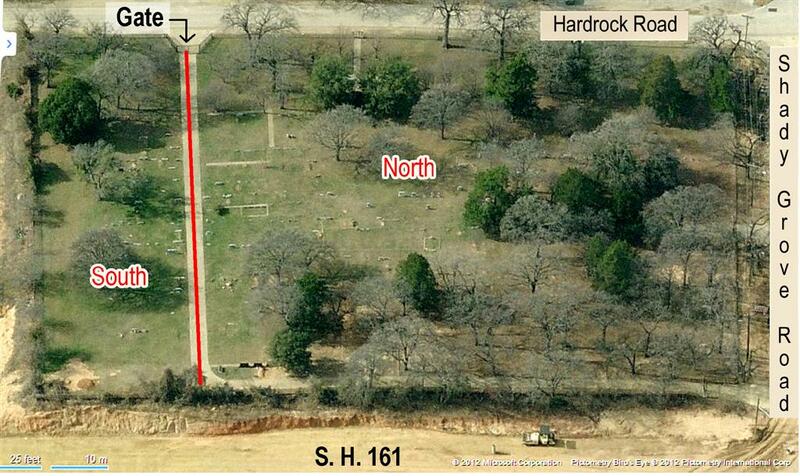 Grand Prairie designated Shady Grove Cemetery a Significant Landmark on May 16, 1981. The cemetery is still in use with approximately 700 (more or less) marked and unmarked graves, the oldest known marker being that of Rhoda Stone (born August 28, 1878; died November 30, 1878). Veterans from as far back as the Civil War are buried here.